Mom appeared to be explaining something to her little charge as he sat on the verge of tears. Slowly, his ears twitched, and he perked up. He walked around his mother, then under his mother, then she patted him on his back with her trunk, over and over again. Surprisingly “mom” allowed me to get closer than I’d expected. It felt as if I was eavesdropping on a tender moment. But the love and affection in a beast the size of a bus amazed me. Somehow God has instilled motherhood into females of many species other than humans. 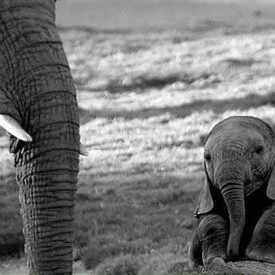 When I think of the times that God has allowed me to sit and sulk, and then come at just the right time to lift me by my bootstraps, I feel very much like that baby elephant. God is faithful, all the time. He has a plan, and it’s amazing. Next: ARE THERE LIMITS TO SPREADING THE GOSPEL?